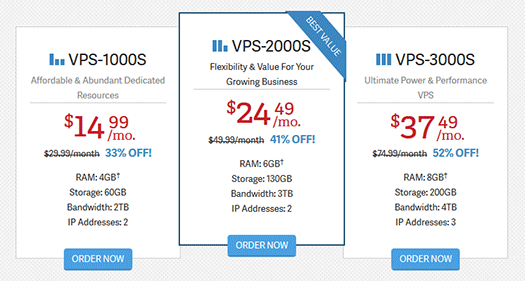 INSTANT SAVINGS: Use our visit link on this site to save up to 52% off their normal VPS rates. Are you considering purchasing an InMotion Hosting Virtual Private Server? On this page, you will find my full in-depth review of their service from packages and pricing to what the service looks like once you are a paying customer. The goal of this page is to inform you of everything from the pros to the cons of using this service as your VPS provider. If you are left with questions, contact me so I can make an update! InMotion Hosting has been selected as the best Virtual Private Server provider on BestVPSReviews.com for several reasons. This page is my full review write-up on InMotion Hosting which should cover everything you want to know about this service and more. I've spent weeks scouring the web for reviews, questions, and other various concerns from their customer base to complete this in-depth review. Let's quickly get the essentials out of the way so I can move on to my actual review of InMotion Hosting. If this review is missing anything you'd like to see me cover here, simply contact me with the link at the bottom of this page. A quick note: To provide you with a better viewing experience, this page includes all screenshots and other various images that help support my claims in this InMotion Hosting VPS review, therefore, depending on your Internet connection, please allow time for this page to fully load. InMotion Hosting offers their Account Management Panel (AMP) to help you get answers to common questions, and issues you may face after you first setup your VPS. Account Notifications - As you can see on the right, you have full access to your account notifications including all of the benefits InMotion Hosting provides you including free advertising credits, notifications regarding requested additional features, and a more. Announcements - To the right of Account Notifications (not shown), you have Announcements that will alert you if there is any problems with the service including network outages, hardware failures, and scheduled maintenance. Additional Services - Here you can request new hosting accounts through the "Hosting" link, purchase a domain through the "Domains" link, request a domain transfer through the "Domain Transfers" link, order custom web design through the "Web Design" link, and through the "Other" link, you can add additional services such as request an SSL certificate (needed for eCommerce shopping carts), request root access (more on this in the next section below), request Fantastico installer (additional fee), request a simple certificate (CSR), or request Softaculous (additional fee). Accounts & Billing - When you click this "Details" link, you are provided the screen on the right which details your VPS plan as well as renewal date, term, and links to your admin details that has everything from your user name, server name, WHM URL, temp URLs, nameservers, and more. Your password to your account is not shown on this screen for security purposes, so you'll need to refer to your emails you've received once your VPS is setup. Overall, I love the AMP setup InMotion Hosting has. Unlike other VPS hosts who provide no page that has all of this information, this is a welcome addition and should help with customer's who are new to hosting. 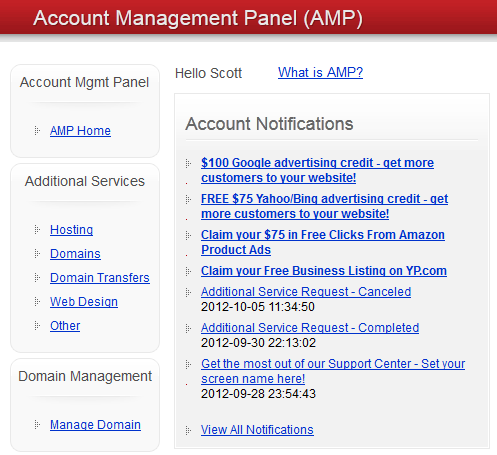 I should also mention this AMP is used with all of their web hosting plans. If you only want an InMotion Hosting business hosting plan, you'll still have access to this screen with your shared hosting information included. InMotion Hosting customer service is not outsourced and based out of the United States, which is a huge plus over many VPS companies. InMotion Hosting offers 24 hour customer support, 7 days a week. InMotion Hosting is an employee owned and operated web hosting company with a staff that overages over 5 years of web hosting experience. Their senior staff have over 10 years of web hosting experience. From my own experience dealing with InMotion Hosting customer support, they have been very knowledgeable and friendly. I have used their live ticket system and their live chat system with excellent results. Update January 10th, 2015: I made a huge mistake yeterday and actually deleted the wrong cPanel account for a site I was working on. I emailed InMotion support with a priority level 5 and they got right back to me. In fact they were able to restore the cPanel account from a backup that was only 2 days old. I could have lot a ton of work and I'm glad they were able to actually restore my account. InMotion restored the account within 2 hours of my ticket and that was including them having to refer the situation to an upper level support tier who could do the restore. I've had a few tickets since this initial writeup and believe me, I'm still totally satisfied with their service. True to my tell it like it is approach to this website, one of my biggest complaints of InMotion Hosting's VPS service is the initial VPS you order comes packaged in a tightly controlled environment. What I mean by this is the VPS you are given is setup with a WHM reseller account only for you to add additional cPanel accounts through. Although, I understand the need for this page to the left here, I have a few problems with it. For one, I think this prompt to get root access is a tad "rough around the edges." For me personally, I needed root access to easily transfer my VPS cPanel accounts (over 20 at the time) by uploading my cPanel accounts to the server's main /home folder. When you upload cPanel accounts there, you can then go to your WHM and "Restore a Full Backup/cpmove file." This is a handy feature that prevents you from having to create a cPanel account then go in that cPanel account and restore your backup file, a massive time saver for me. Two, being used to WHM VPS accounts, I wanted to be able to further "harden" my VPS with additional security settings that aren't setup by default. I won't go into specifics on what I do to help protect this VPS account's security but you can do a quick Google search on this to get an idea, or two, or twenty. Most, if not all, of these settings aren't available in a limited WHM reseller account. 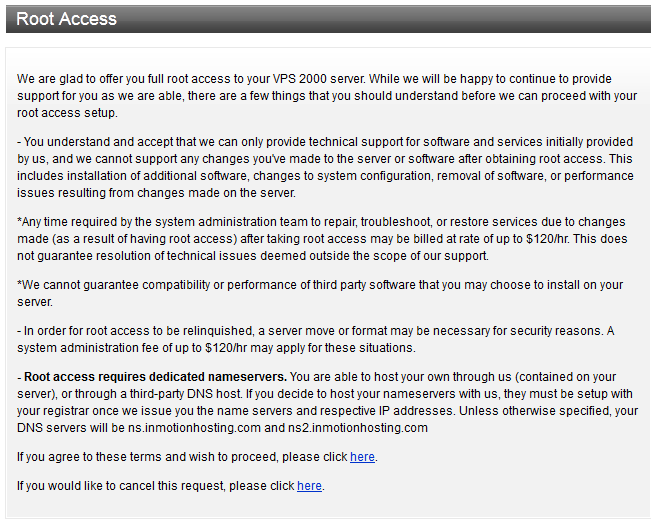 If you want to secure your VPS like I did, you'll have to face this screen too. I spoke with InMotion Hosting customer support about my concerns with the above screen that implies $120/hr customer support after I have root access, and their customer support representative jacobc replied "We will continue to support all the originally configured software and your server at large now that you have root access. Note that an hourly fee for troubleshooting would be necessary only in catastrophic circumstances where failures on the server were the result of root access." In all, the root access request page could be rewritten to better portray when you'd be charged a $120/hr fee. If you need root access to configure your VPS via WHM or to upload some files to the root directory, you should be fine. If you need root access to uninstall software, install new software, or otherwise change the default VPS setup, this is when you can run into problems. By the way, this is my only negative to InMotion Hosting's VPS service. I'd love it if InMotion Hosting's owners saw this and decided to make improvements based on this constructive criticism. A couple things I'd recommend is to add the ability to request root access at the time of VPS setup and more importantly, make the above root access page friendlier! I'd go into more detail about what will and won't require that expensive $120/hr rate. It scared me into asking for more information, and I've always had root access VPS plans, dating back at least 5 years now! Here is where I hope to go above and way beyond what these other "review sites" show you. Below, I have included InMotion Hosting reviews from countless trusted resources. By that, I mean, sites that have moderators that actually receive your review and then verify the authenticity of your information. SPECIAL OFFER - Save up to 52% by ordering through our this link. I haven't received any real customer reviews yet to BestVPSReviews.com but when I do, they will appear linked here. If you've used them, please help me out by being my first reviewer? I'm also looking for sources that have verified VPS reviews (there aren't many, most are shared hosting related). Don't need or want cPanel / WHM on your VPS? Don't use InMotion Hosting according to this review. Member ScottRose of WebHostingTalk said he tried to remove cPanel via root access and the VPS was later restored back with cPanel configuration. If you need a barebones VPS, this isn't the service for you. Regarding customer support during this experience. he said "Customer service was pretty responsive and helpful when I requested and obtained root access, and responsive when I was trying to keep cPanel removed." Around 50 or so real customer reviews for InMotion Hosting are available at the web hosting section of TopFiveAwards. $100 in Google AdWords credits when you spend $25 first. $75 in free clicks on Amazon Product Ads placement. A free business listing on YP. 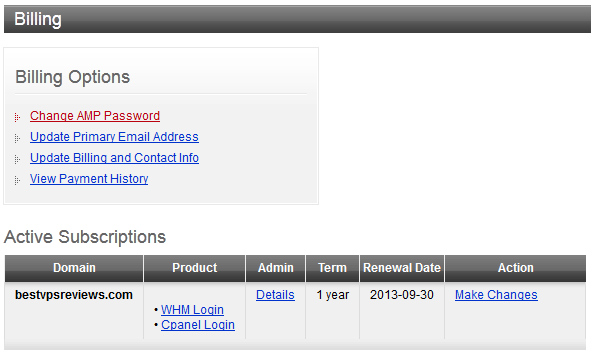 Free cPanel/WHM is included! This option alone can cost you over $425/year for a dedicated license. Free backups of your VPS up to 10GB. InMotion Hosting offers one of the best promotional discounts we've seen from many of the other web hosting companies. The major difference here is the fact that InMotion Hosting extends these discounts to their VPS customers which is an awesome deal. Think about it for a second, if you signed up to an InMotion Hosting VPS for one year on the VPS-1000 plan, your cost is $344.88 at $29.95 a month ($14.95 for the first month). 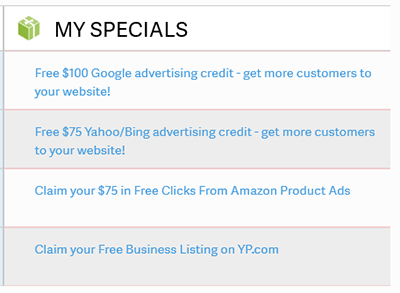 If you utilize all of the discounts in free advertising, you'll save $250 in advertising plus a free business listing on YP.com. Pretty nice deal! Regarding the free backups, as long as your VPS doesn't grow to over 10GB in size, InMotion will automatically back up your VPS every 24-36 hours. If your VPS is over 10GB, you can request this backup service for an additional fee. Multiple data centers - IMH currently has two data centers, one in Washington, D.C. and the other in Los Angeles, California. These data centers support peering to boost the speed of your page load times by up to six times. N+2 or N+1 power systems - These power systems increase reliability and IMH backs up this power with multiple battery and diesel power sources in case of a power failure. RAID5 - All servers use N+1 configurations with RAID5 hard disk arrays. This helps prevent data corruption and in case of a hard disk failure, InMotion can replace the disk with little to no down time. 24/7/365 system administrators - InMotion Hosting keeps administrators on hand, around the clock. Should something happen, they are there ready to respond! Lastly, and worth repeating, InMotion Hosting includes up to 10GB of backups to your VPS every 24-36 hours. I take the backups a step further and use the built-in WHM backups to create backups of all of my accounts on a weekly basis. When WHM automatically emails me that my backups are ready, I log in to my VPS and download them so I have my own personal copy. I actually keep 2 years worth of these backups because I'm OCD when it comes to backing up my data. I've had a catastrophic VPS failure with no backups before and since then, I've kept these backups for my own peace of mind (you should too!). 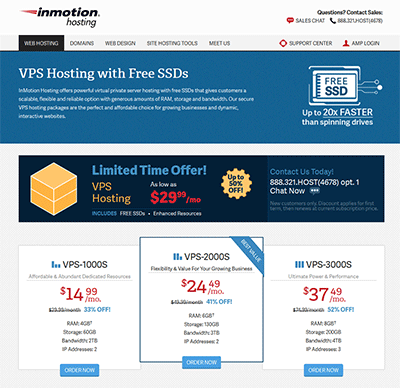 I hope I've covered everything you were wondering about InMotion Hosting's VPS service. As part of my ongoing research with their VPS plan, this site is hosted on one of their VPS plans so I can see how things are for the long haul. Specifically, I've chosen the VPS-2000 plan for the added RAM and storage. I also needed the extra IP addresses for a couple sites I'm hosting on this VPS as well. If I come across any issues or awesome things to report, they will be reported here on this page for viewing so be sure to check the revision date on the bottom of this page. In the future, I plan to add further technology to this site that includes uptime measurements, occasional speed tests, and more. These features and many more will depend on the growth of this site (without your support, I can't afford to add these features). So please, if you wouldn't mind helping me spread the word about my little corner on the web, please do. Mentioning us on Twitter, Facebook, your blog, your website, and anywhere you see people asking for VPS assistance, I'd definitely appreciate the help! Thank you! !